Video frames, ground-truth, and the predicted geometric context of our system. We achieve high accuracy leveraging motion, and appearance features while achieving temporal consistency by relying on spatio-temporal regions across various granularities. 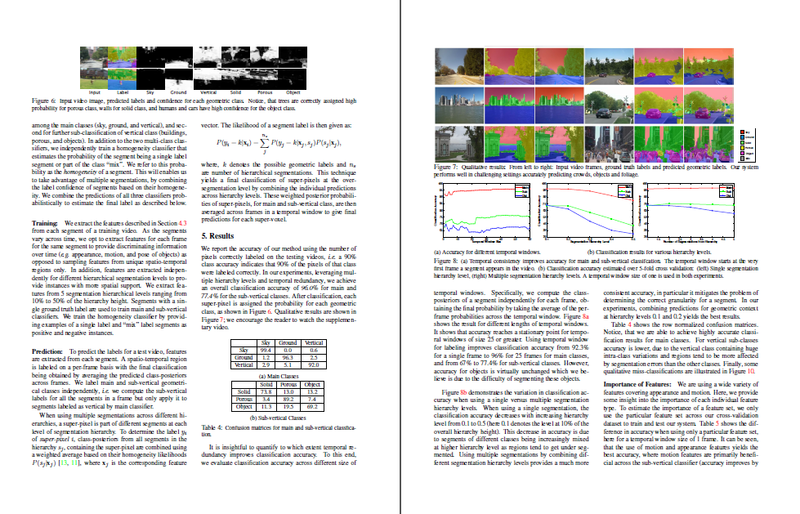 We present a novel algorithm for estimating the broad 3D geometric structure of outdoor video scenes. 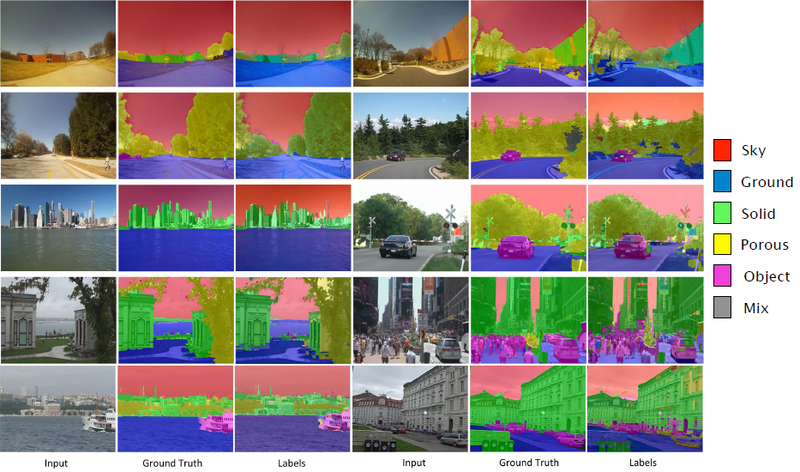 Leveraging spatio-temporal video segmentation, we decompose a dynamic scene captured by a video into geometric classes, based on predictions made by region-classifiers that are trained on appearance and motion features. By examining the homogeneity of the prediction, we combine predictions across multiple segmentation hierarchy levels alleviating the need to determine the granularity a priori. We built a novel, extensive dataset on geometric context of video to evaluate our method, consisting of over 100 ground-truth annotated outdoor videos with over 20,000 frames. To further scale beyond this dataset, we propose a semi-supervised learning framework to expand the pool of labeled data with high confidence predictions obtained from unlabeled data. Our system produces an accurate prediction of geometric context of video achieving 96% accuracy across main geometric classes. You can download the original videos, ground-truth, and fold partition indexes used in our paper (see readme.txt for detail about data).